Skywatcher Stephen Mudge captured this photo of the Chinese Tiangong 1 and Shenzhou 9 spacecraft docked together over Brisbane, Australia June 20, 2012. Last week, Chinese astronauts docked two spacecraft together in orbit for the first, and now skywatchers on the ground have captured the scene. Chinese spaceflyers Liu Yang, Jing Haipeng and Liu Wang launched June 16 on the Shenzhou 9 spacecraft. Two days later, on June 18, the astronauts (known as taikonauts), docked their vehicle at the robotic Tiangong 1 module, which had been in orbit since last autumn. The two craft have been orbiting Earth together since, with the astronauts — including China's first female spaceflyer — living and working onboard. From the ground, the docked Chinese vehicles look much like many other satellites, appearing as a swift-moving pinpoint of light passing across the sky. Mudge had shot one of the Chinese spacecraft before. On March 31, before the Shenzhou 9 mission launched, the skywatcher caught a view of Tiangong 1 crossing overhead just five minutes apart from a pass of the International Space Station (ISS). "The ISS went over first, followed five minutes later by China's Tiangong 1 station only a few degrees away from where the ISS had been," Mudge wrote in an email to SPACE.com. 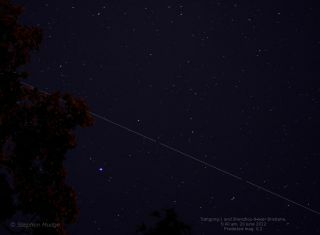 The Chinese Tiangong 1 module flies over Brisbane, Austria five minutes after the flyover of the International Space Station in this photo taken March 31 by Stephen Mudge. The International Space Station is the $100 billion product of a collaboration between the United States, Russia, Europe, Japan and Canada. Tiangong 1 is much smaller, but it is the prototype module for China's goal of establishing a space station of its own by 2020. The ISS is the brightest man-made object in the sky. In comparison, Tiangong 1 is clearly fainter in the photo. Nonetheless, both are plainly visible against a backdrop of trees and purple sky in Mudge's photo. The Shenzhou 9 crew is scheduled to remain in orbit for a total of 13 days, meaning time is running out for skywatchers to catch a glimpse of the history-making mission. Another great resource is the website Real Time Satellite Tracking, which shows the variety of spacecraft that will be flying over any given region at any time. Editor's note: If you snap amazing photos of China's Shenzhou 9 capsule or Tiangong 1 module in orbit that you'd like to be considered for use in a story or gallery, please send pictures and comments to SPACE.com managing editor Tariq Malik at tmalik@space.com.